The open-air Cabana Café is the social heart of Cabana Desolation Eco Resort. The design uses the same materials and principles as the cabana accommodations. This rich, locally milled wood embraces the island’s stunning natural setting and creates a friendly, warm atmosphere. The handcrafted post-and-beam building is the perfect place to enjoy wonderful foods and drinks from the kitchen. It is also enjoyed as a place to hang-out and read a book or converse with other guests. The intimate nature of the resort itself – with a maximum capacity of only 10-12 at a time – means that our guests often find that the old adage runs true: you may arrive as strangers, but you leave as friends. The Cabana Cafe operates like the hub of a wheel, with guests drifting in and out between the cafe and diverse surrounding areas for adventure, exploration, socialization, and relaxation. The boardwalk and trails radiate in various directions from the cafe, linking opportunities for access to many of the natural features that help make Cabana Desolation so special. The Cabana Point is perhaps the prime spot to relax at the resort, jutting out into the ocean with 180 degree views of Desolation. Trails, beaches, the ocean and various pockets of solitude with hammocks and deck chairs are found mere steps from the edge of the boardwalk in each direction. Campfires at South Beach, discovering old growth firs off forested trails and snorkeling amongst intertidal creatures are all easily accessed from the central hub of the cafe. 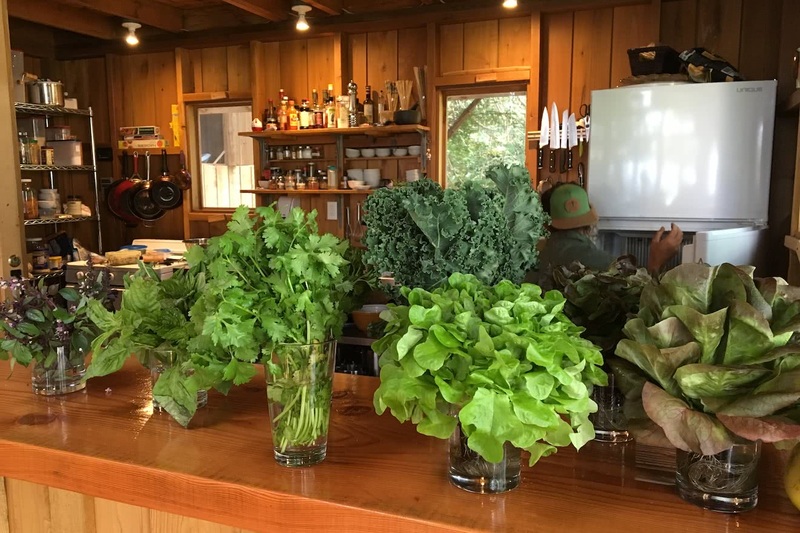 Despite the remote location and off-grid style, the Cabana kitchen is fully equipped with everything our talented cooks need to reach surprising culinary heights. 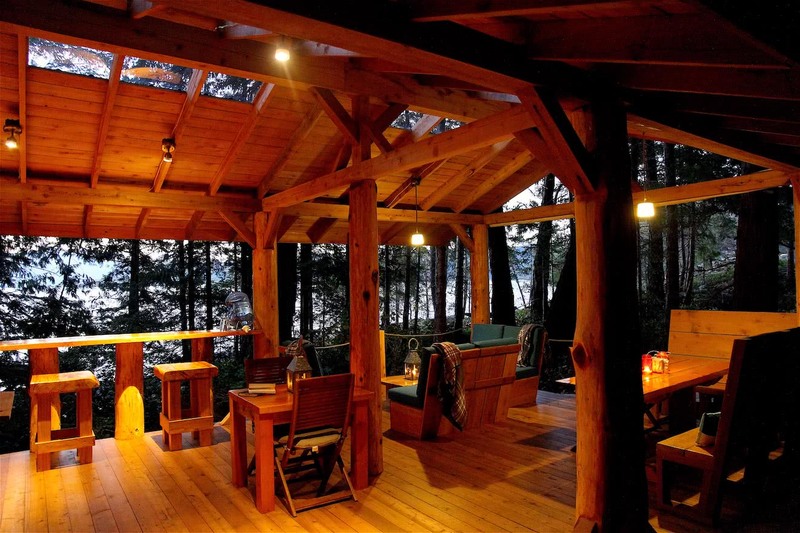 The wooden, open air design fits seamlessly into the handcrafted nature of the resort. The wooden bar connected to the kitchen is the perfect spot for enjoying a refreshing beverage or afternoon tapas. 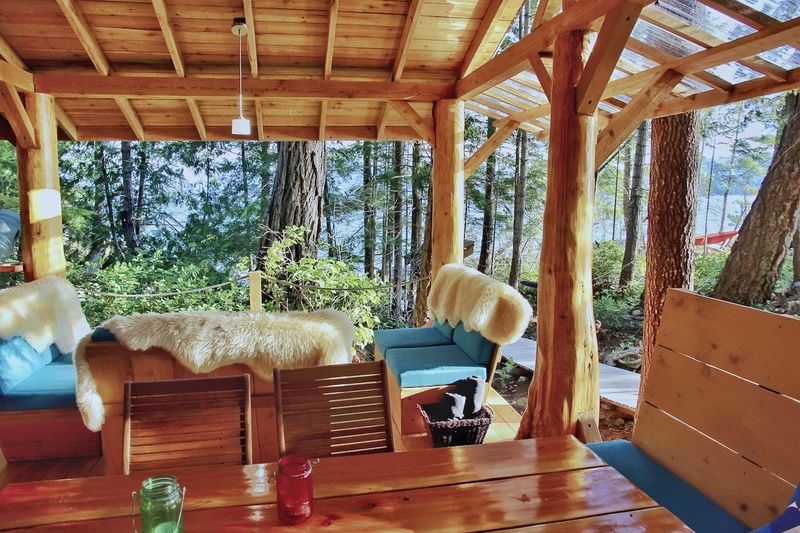 Sit and relax as you gaze out through the forest at the afternoon sun slipping towards the horizon in Desolation Sound! For more information on our Cabana Cuisine, please continue reading here.